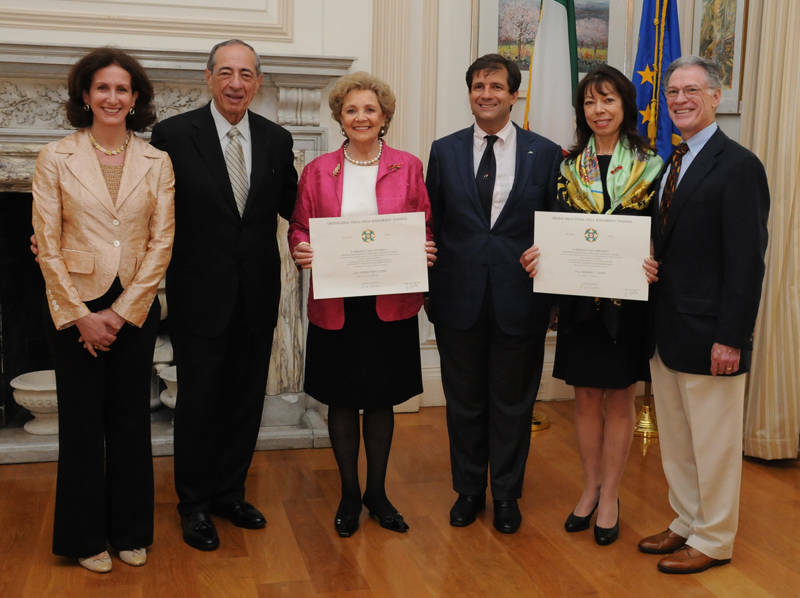 The President of Italy, Giorgio Napolitano, has awarded the first mom and the first sister of the state of New York, Matilda and Margaret Cuomo, with the titles of Grand Officer and Commander of the Order of the Star of Italian Solidarity in recognition of their roles in promoting Italian language and culture. On Friday, during a private ceremony at the Italian consulate attended by the former Governor of New York, Mario Cuomo, the consul general Francesco Talo’ delivered the honorary badges on behalf of president Napolitano. “These are little sign expressing how Italy feels about your work. But they are also signs of commitment, accepting these medals, you assure that you’ll continue to work with this spirit,” said the consul. Matilda Raffa Cuomo, who has been married for more than 50 years to Mario Cuomo, and is the mother of the current Governor Andrew Cuomo, has worked for all her life to promote education. When she was the first lady of New York, she established the Mentoring Program, which provides mentors for children to face issues such as school dropping out and teenage pregnancy. In 1998 she was one of the founders of Mentoring USA Italia, which has helped more than 8,000 Italian children. “I accept this in honour of my mother and my father. How proud they would be. Growing up I had all the benefit of what Italy is all about, music, food. I couldn’t wait to finally visit Italy myself,” Matilda Cuomo said. Along with her daughter, Margaret, who is president of the Italian Language Foundation (ILF),Matilda Raffa Cuomo, has also promoted the study of Italian language. Thanks to the effort of ILF, the Advanced Placement Program in Italian Language and Culture, which was suspended after the 2008-2009 school year, will be reinstated beginning September 2011. “Learning Italian and about Italy is important not only for people who are originally Italians, but for all the Americans. Italy has contributed so much to American, culture, philosophy, system of government, and art,” said Margaret Cuomo.